In the previous article, we saw how to create SpringBoot projects within NetBeans using the awesome NB SpringBoot plugin. 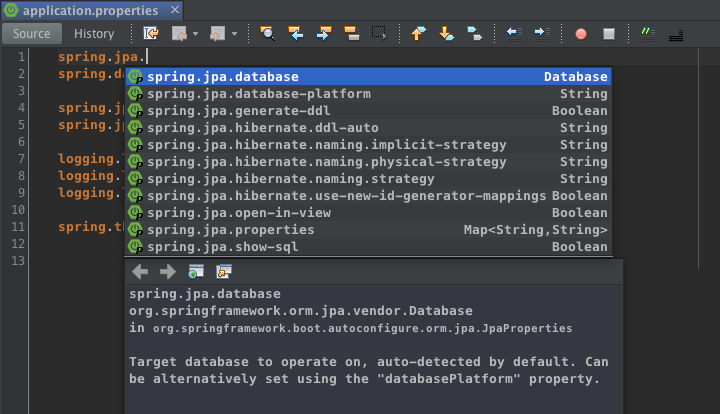 In this article, we'll continue the tour of the NB SpringBoot plugin and see in what other ways it can help you to develop Spring Boot applications usng NetBeans. The Controller and RestController options are only available if you have added the spring-boot-starter-web artifact to a project. One of my favourite features of the NB SpringBoot plugin is the application.properties file editor and its syntax highlghting and name completion. When editing an application.properties file, the editor provides popup completion for attribute name and attribute values as can be seen in the screen shot above. This can provide a great productivity boost when you can't remember the exact name of properties to set. All of the available properties are displayed along with their type and a short description of what they do. On the Navigator panel within NetBeans, a new Request Mappings drop down is avaiable. Selecting this shows all of the @RequestMapping method within the currently selected class. Double clicking on any of these opens the appropriate method within the code editor. There are many more features available within the NB SpringBoot plugin such as forcing a restart of a SpringBoot application, or confiring the start-up options for the application, but in this and the previous article we've seen how Spring Boot support is enhanced within NetBeans by installing the NB SpringBoot plugin. If you develop applications in Spring Boot, this is a must-have plugin for NetBeans users. What's your favourite feature of this plugin, or do you think anthing is missing? Leave your comments below.